Fans of both authors might be surprised to discover that Jane Austen’s Emma was a little too prim for fellow writer Charlotte Brontë. Brontë, who was born just after Emma’s 1815 debut, wrote her editor William Smith Williams a letter detailing her feelings about the book some 35 years later in 1850. In her letter, she praises Austen’s ability to sketch the lives of the English gentry with accuracy. “She does her business of delineating the surface of the lives of genteel English people curiously well,” Brontë wrote. Yet Austen (who died in 1817) failed to understand people’s passions, according to Brontë, whose Jane Eyre has more than enough passionate characters to go around. Her business is not half so much with the human heart as with the human eyes, mouth, hands, and feet. What sees keenly, speaks aptly, moves flexibly, it suits her to study; but what throbs fast and full, though hidden, what the blood rushes through, what is the unseen seat of life and the sentient target of death—this Miss Austen ignores. She no more, with her mind’s eye, beholds the heart of her race than each man, with bodily vision, sees the heart in his heaving breast. Jane Austen was a complete and most sensible lady, but a very incomplete and rather insensible (not senseless) woman. 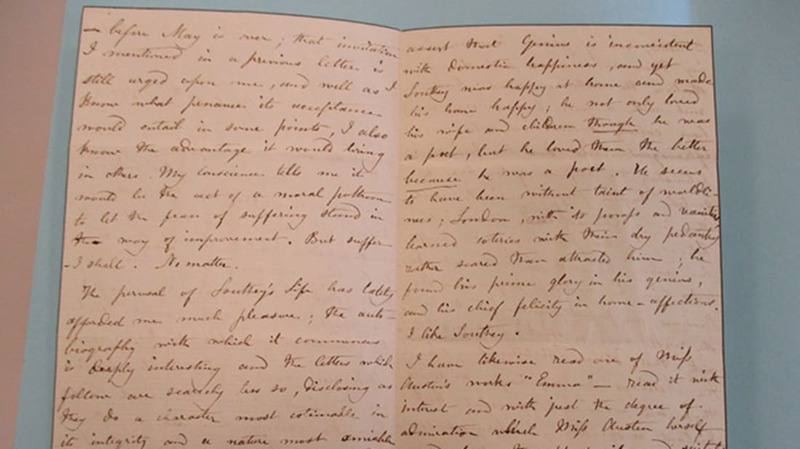 The letter is now on display in Emma at 200: from English Village to Global Appeal, a bicentennial exhibition on Austen’s novel at the Chawton House Library in the UK. One question remains: Would Brontë have preferred Clueless? All images courtesy the Huntington Library California via the University of Southampton.